Well... on the positive side, some of the words he uses can also be found in Shakespeare..
What is that analytic passage of him he talks about? One should perhaps look at the original, possible autocomplete ..
Now there is someone who can definitely "Wax Poetic". Almost wants me to become a card-carrying Jackass. This is Beto O'Rourke's district, and he wants to tear down the wall. 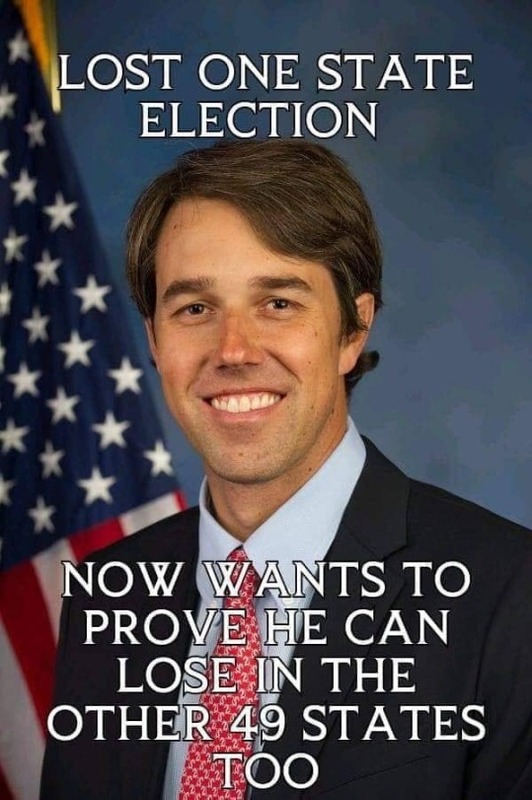 He's not a serious contender, the only reason the likes of Beto, Bernie, the fake Indian and others are running is to assist DNC data harvesting to help Biden when he enters the race. Thirty years ago, I took a marketing course, the instructor started the class by putting up a slide showing a half dozen laundry detergent brands and asked to describe the features, advantages, and benefits of each that would make one product more appealing than the others. When we were finished, he told us Procter & Gamble manufactured of all the different brands and each had exactly the same active ingredients. One brand marketed to high-income, another middle-income, and the remaining lower-income families. This enabled the Proctor & Gamble company to dominate the market. The Democrat's marketing experts are using the same approach; they will tailor a different message to the supporters of each presidential hopeful in order to get their vote and that is why so many Democrats have entered the prudential race this early. It is time for the Republican Party strategists to wake up and smell the coffee before it is too late. (03-20-2019, 03:28 PM)Canuknucklehead Wrote: ...he told us Procter & Gamble manufactured of all the different brands and each had exactly the same active ingredients. One brand marketed to high-income, another middle-income, and the remaining lower-income families. This enabled the Proctor & Gamble company to dominate the market. Not quite. Although that instructor sounded logical, he missed it. I majored in Advertising Design, with a minor in Philosophy and Logic. What you should have learned is the goal of P&G was to establish its namebrand in all economic niches. If its product is over-priced in some markets, they try to provide something affordable for greater sales penetration. The aspect your instructor was pointing to was the use of generic branding. P&G will produce products for big-box stores for a reduced price, in order not to lose the sales, but under the veil of inhouse-branding. You can find an inhouse brand at Target, right next to the Head and Shoulders brand in an obviously copy of the H&S product. Guess what? H&S makes it for Target's inhouse branding, with just enough difference in the recipé to make it measurably inferior to the namebrand. If they didn't make it themselves, the imitators would be in violation of patent infringement. What the Democrats want is a type of name-brand notoriety that allows them to say things that the target realizes is not exactly what is meant. It is the wink-and-nod. LBJ said he's for minority rights, but his followers knew he just wanted their votes. Beto says walls are immoral, but his backers know he just wants approval by illegals. To Dems, it does not matter that a campaign promise is different for one group than for another. They all realize the wink-and-nod, and write their own definition from the clichés.